My Big Book of Bible People, Places, and Things is a Bible dictionary, published by Barbour Publishing, that is just about perfect for explaining exactly what the title suggests - who certain people, places and things were - in scripture. Designed for children ages 6 to 10, it is illustrated in a cartoon-like fashion. Short descriptions are provided for things from Aaron to Zophar. At the end of this dictionary there is also a very basic map of the Holy Land for the children to be able to familiarize themselves with where certain events took place. Jordan River = Jesus was baptized in the Jordan River. He was baptized in the river that flows from the Sea of Galilee to the Dead Sea. Legion = A legion is a very large number of people or things. Mote = A mote is a tiny speck of dust or dirt. Seven Churches = The seven churches were seven groups of Christians in Asia Minor. In the book of Revelation, Jesus had a message for each church. Some were doing well. Others needed to love and trust Jesus more. Scripture references are given alongside each picture and definition. 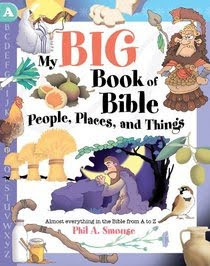 Author and illustrator Phil A. Smouse wanted to create something to help him instruct his own children in learning about the Bible and so presents this resource in a kid-friendly manner. I think he accomplished his goal. There are 254 pages in this paperback edition and it is a handy resource for inquisitive minds. Get Wisdom! 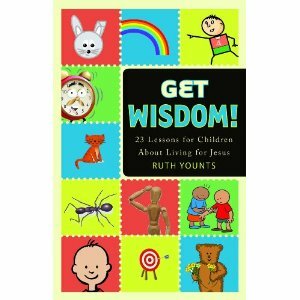 : 23 Lessons for Children About Living for Jesus, by Ruth Younts, is a fairly new release from Shepherd Press. Want to walk and talk your children through the book of Proverbs? This may be a good place to start for you. Divided up into 23 lessons as the title suggests, this book operates as something of a workbook, designed to be used by parents and teachers. "Listen, my sons, to a father's instruction; pay attention and gain understanding." There are examples given as to how one can be a good listener, blank spaces for writing down one's own thoughts and a short prayer to conclude the lesson with. At the back of the book there are teacher notes for each lesson, providing ideas for games, activities and pointers for how to discuss the verse and its particular application. Get Wisdom! is labeled as being a good resource for ages K5-Grade 4. It seems to be primarily geared for classroom use but is easy enough to adapt for home use as well. Good resources to know of if you are looking for something to help explain particular scriptural lessons or need to explain what something is that is listed in Bible passages. Thanks, Barbour Publishing and Shepherd Press for sending copies of these books my way to check out. I've actually have been thinking it's time to examine Proverbs. Interesting. I've been thinking about what to do with my kids this summer/fall. Will and Ben have both professed faith in Jesus and it's time to start building quiet time habits. Thanks for these. I might want to pick up Get Wisdom to go through with my almost-5-year-old this summer or fall. Looks good. do you think this would be good for children's church (k-5)? does it give enough activities for a 70 minute minute class or would i need to supplement?